Sharing guest room ideas today on the blog for a comfortable stay for your guests. I have always enjoyed hosting and sincerely believe that guests bring many blessings to the home. Here are some ideas to make them feel welcomed. 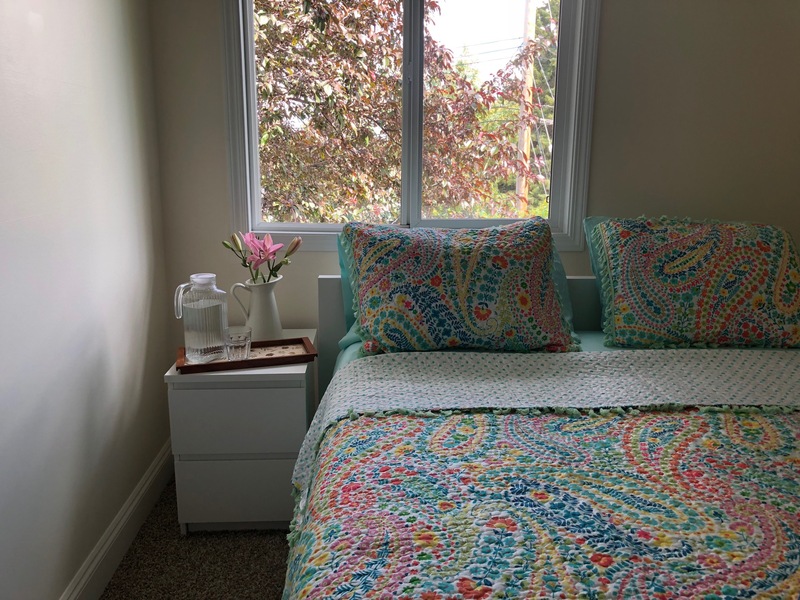 I have also added ideas below if you don’t have a dedicated guestroom, there will be a shared washroom situation or if your guests include children. Make sure there are clean sheets on the bed with ample pillows. Leave a warmer blanket inside a cupboard incase the guests feel cold at night. Leave a glass and bottle of water by the bedside. Fresh flowers are always a great idea if you can manage. If the cupboard is used for other purposes, do make sure you make some space for your guests to put in their belongings along with some hangers. Leave a Jaa Namaz inside the cupboard. You can also leave the namaz schedule inside a drawer shelf and make a paper arrow that points in the direction of Qibla. Place fresh clean towels inside the cupboard. I also like to make a welcome basket for my guests putting in a welcome note, Wifi password and some snacks. Make sure there is a trash can in the room with a trash bag for lining. A lot of us have a shared washroom for guests but make sure it’s clean. Leave a tray and glass for your guests to place in their toiletries. When I have guests coming by plane, I ask them about their preference for shampoo/conditioner/bodywash etc. and stock them before hand so that they don’t have to bring them in their luggage. Ask the parents if the child would need a crib, car seat, feeding chair etc. The parents usually make arrangements themselves but having this discussion before hand is helpful. A lot of times these items can be borrowed or rented if you don’t have them. I like to leave a stool for the little ones in the washroom so that they can reach the sink. Ask the parents if the child has food preferences and what they enjoy so that you can stock your fridge. What if you don’t have a dedicated guest room? If you don’t have a dedicated guest room and plan to use yours or one of the kid’s make sure you takeaway all personal belongings that you will need over the visit. Make space for the guest in the cupboard and follow some of the guest room tips above to make the room welcoming. Hope you enjoyed all these tips! Do share your best guest room ideas!